The company we chose to supply our court were Anglia and Midland Sports Surfaces. We had gone through a formal specification and tendering process and we felt comfortable with what they were offering and that they would deliver on their promises. On this first day the weather was wonderful. Jonathan and Charlie from AMSS turned up as planned and the initial excavation work began. A tennis court is around 600 square metres in total area and needs to have just a slight (1 in 100) slope so that the water drains away easily. In addition, because the playing field has a clay base, the foundation depth needed to be 250mm (about 10") - so ultimately around 300 tons of topsoil and clay needed to be moved and thanks must go in abundance to John Cole and Graham Reeve who kindly volunteered to transport the soil and dump it on John's land. Everything went well and the day finished with most of the excavation completed but the weather forecast for Day 2 was not good so it was fingers crossed that there would be enough time before the rain came on the Tuesday. As you can see from the grey skies in the picture below, the weatherpeople got their forecast right for once. The AMSS guys and John Cole battled through the wind and rain and all of the topsoil was removed - however an amount of clay still needs to be excavated. When this is done, the site will be ready for the next stage when the geotextile membrane (through which water can go downwards but weeds cannot come upwards) is put in place. After that, around 300 tons of stone will be added, compacted and levelled. 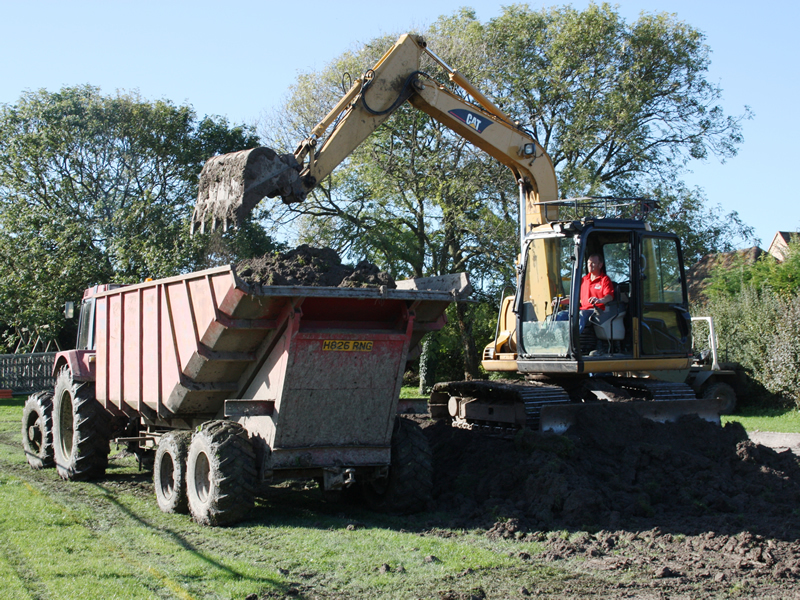 This will require around 15 x 20ton vehicle movements - hence the Playground and the Playing Field being closed until this work is completed (later on this week). A better day but after a lot of rain on Tuesday it was decided to let the area dry out before further work takes place. So AMSS and John Cole will be back first thing tomorrow to get on with the work. The BBC forecast is good for the rest of the week so fingers crossed, the first part of the process will be completed by the weekend. Nice day, a bit cloudy but warm and breezy so good drying weather. John and Graham again did their stuff and the site was cleared of everything that needed to be moved. Again, the village should be so thankful for the endeavours of these two gentlemen. Then the geotextile membrane was put in place and the stone started to be added as it arrived. The main feature of the site now is MUD! The AMSS boys are going to bring some "carpet" to put down and will leave the site as best they can but doubtless we will need to carry out some remedial action before the next Reach Fair. The picture below shows Jonathan (Manager) on the left and Charlie (done all the hard graft so far) on the right - the normal British combination! Tomorrow is all about more stone arriving (a further 240 tons) then compaction of it. After that these guys hand over to the construction team. Another good weather day. All the stone is now down and on Monday it will be levelled and compacted. After that, Tuesday, maybe Wednesday the construction team will arrive and the new court will be built on the foundations we currently have. If all goes well it will be playable (black surface but with temporary lines) by the end of November. The coloured surface will be applied next March/April when the ambient temperatures are right. Sorry for the mud and mess - hopefully a bit of rain will clean the roads in due course and AMSS will leave the site looking looking as good as they can. 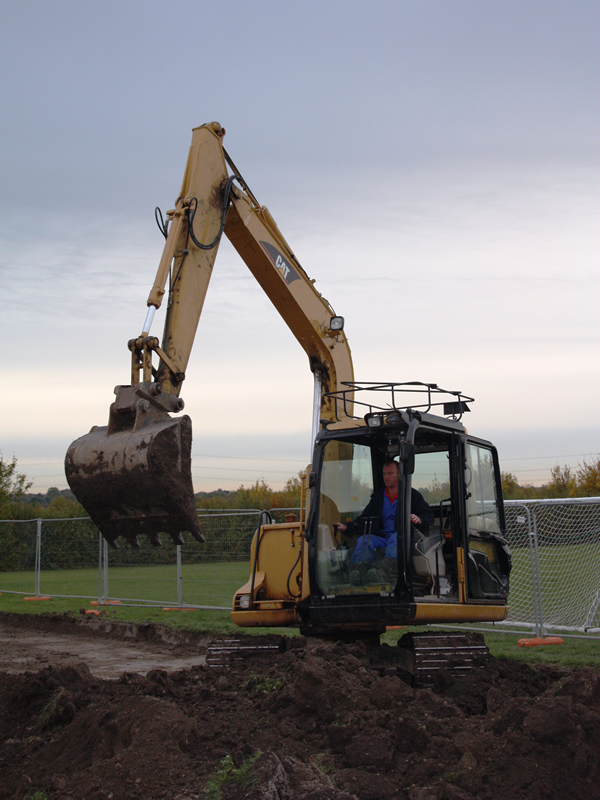 Now that major vehicle movements have ceased, the Playground and Playing Field are open again - but PLEASE TAKE EXTRA CARE WHILE THIS WORK IS GOING ON. No activity today - lockable storage unit awaited. Lockable storage arrived along with other items so that work can continue. The stone was levelled and compacted and there is a new team in place, led by Dave. Nice name - bodes well. Should be just a couple of weeks now, weather permitting, to get the court completed. Continued progress with fencing posts now in place and the weather holding well. Now is a good time to introduce you to the new team of Dave (left) and Chris. We should also like to thank Sue and Ewen Cameron who have kindly provided a supply of water so that the guys can mix their cement. The concrete blocks are ready to go into place plus the net post sockets. After that the two tarmacadam layers can be put in place (temperature permitting). 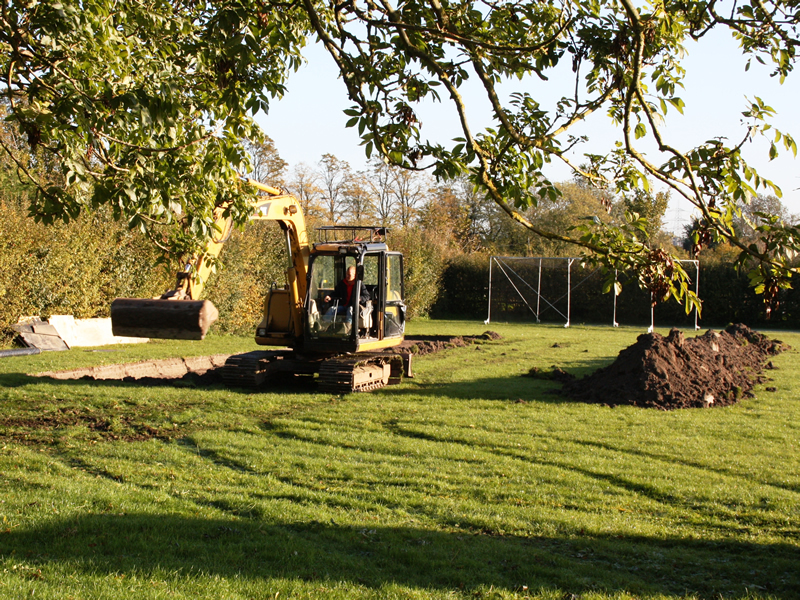 Then the temporary lines will be added and the site landscaped and tidied up. Good progress was made despite the weather. Our height adjustable tennis post sockets are in place as you see below and we now have a gate! Also the edgings are in place to contain the tarmacadam which will be laid shortly. Awful weather so no work possible. A better day and the boys were able to "haunch" the concrete edging slabs, as you can see. Got a call from AMSS to say that they now are awaiting the fencing from their supplier. This fencing, which is extra strength to resist the best endeavours of our talented footballers, will need to be lifted into place using the digger (because of the weight) and they don't want to put down the macadam until this work is completed. The fencing should be with us next week sometime. Awful weather again - and very windy. The macadam (two layers of it) can go down as long as the temperatures are reasonable (down as low as 5-8 degrees) but if it is windy, the heat is drawn out quickly - so a non-windy day is needed. We are still well on schedule though to have the court operational before the end of the month. No work done since fencing still awaited. 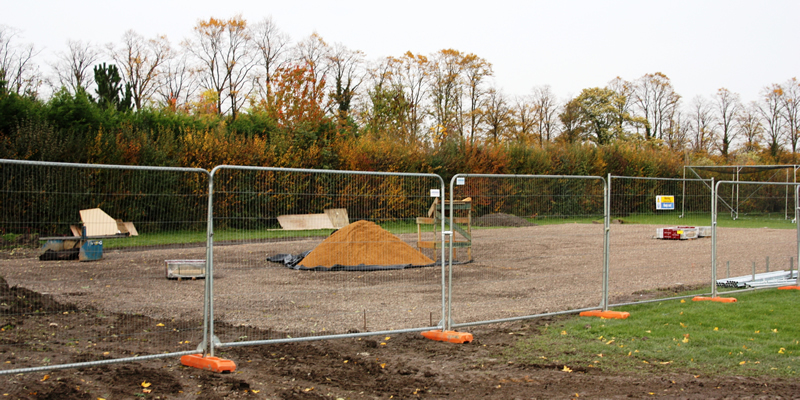 A call was received from AMSS to say that the fencing will arrive tomorrow and work will recommence to put it in place. This is going to take up to 3 days and then the two tarmacadam courses can go down. The first macadam course does not demand special circumstances but the second, final course will require a suitably warm, non-windy day. If all goes according to plan we are hoping to have a simple, local opening ceremony on the 5th of December at 3.00pm. Further details will follow but please make a note in your diary for that time and date. 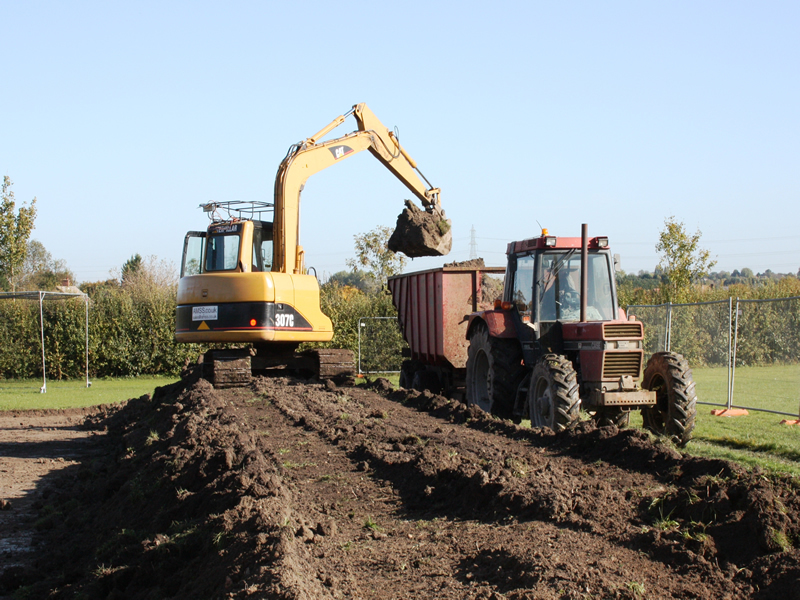 The fencing arrived but AMSS decided to take advantage of a couple of suitable days for laying the two macadam layers. The first layer was put in place. Now the fencing can be added. The finishing touches. The court is finished, it just needs about 10 days to be useable (waiting for everything to "set"). Our short, local opening event is set now for December 5th (Sunday) at 3.00pm. Further landscaping is going on - tomorrow will be the best "finished" shot. When the court is painted there will be a proper, full opening event, with our donors in attendance - probably May 2011. All nicely painted - beautiful!